The London 2012 Summer Olympics are set to begin in just over a month. 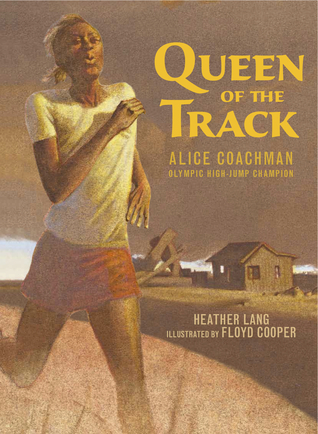 Boyds Mill Press has published a biography of high-jump champion, Alice Coachman, just in time for the young readers who are looking for books about the Olympics. Many children have heard about Wilma Rudolph and Jesse Owens, but Alice Coachman is an athlete whose name may not be familiar to readers. Coachman loved to run and jump as a child growing up in rural Georgia despite her father's objections. It was not "ladylike" to run around barefoot playing sports with boys in the 1930s. After a high school track coach discovered her talents as a runner, Coachman earned a scholarship to attend the Tuskegee Institute in Alabama. Alice became an accomplished track and field athlete while at Tuskegee, and the Olympics were within her reach. Unfortunately, the 1944 games were canceled due to WWII. Coachman didn't give up. She continued to train and qualified to compete in the high jump in the 1948 Olympics in London where she became the first African American woman to earn a gold medal. Lang writes the narrative in a chronological order that will appeal to young readers. The author explains segregation and the racism in a clear manner that children will understand. "Traveling to meets and games wasn't easy. Most restaurants and gas stations wouldn't serve black people. Once when Alice won a race against a top-ranked white sprinter, someone in the stands threw ice at her. But Alice didn't let anything slow her down." Cooper's grainy, pastel illustrations use sepia tones to bring a feeling of history to the story. My only issue with the book design is that the black font can be challenging to see on the muted brown backgrounds. This could be problematic for adults trying to read aloud the story to groups of children. Lang has done her homework on Coachman; a bibliography and list of additional resources are located in the back of the book. An author's note about Coachman and the Olympics are included along with photographs of the track star. Children interested in sports and history will enjoy reading about Coachman's inspirational story and how she "paved the way for future Olympic track stars such as Wilma Rudolph, Evelyn Ashford, and Jackie Joyner-Kersee." Queen of the Track is one of the books the ALSC Notable Children's Book Selection Committee will discuss this weekend at ALA's Annual Conference in Anaheim.